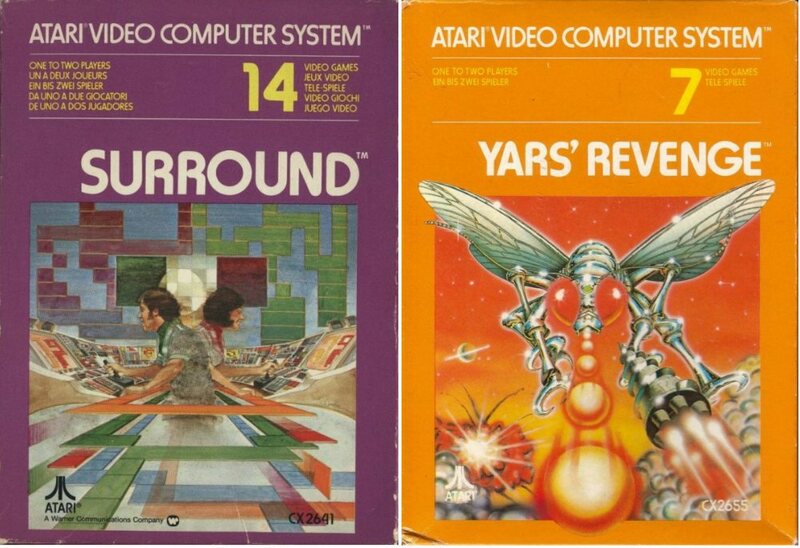 Below is the general Atari variations. We start with description of the various labels and their changes over the years, along with some unique labels and foreign release. After the labels, we describe the box variations and what we consider the general timeline release of the boxes with their changes. We start with the three text versions. In the photo above, the cartridge on the left is the original release. If for some reason your end label has fallen off, there are 2 things to look for to know if it's an original, 1st text, gate-fold game. The letters are larger listing the game options, which you can compare to the other two carts. The easy way is to see the very large Atari logo at the bottom of the label with the part number printed below it. With the 2nd text version, middle of the photo, you see that the game options print has gotten smaller. If you look at the arrow pointing up at the word “video”, it points at the “e”. The “e” is straight in the 2nd text version. The 3rd text version has the same size game options, but the arrow now points to an “e” that is slanted. This also goes for the word “game” at the top. 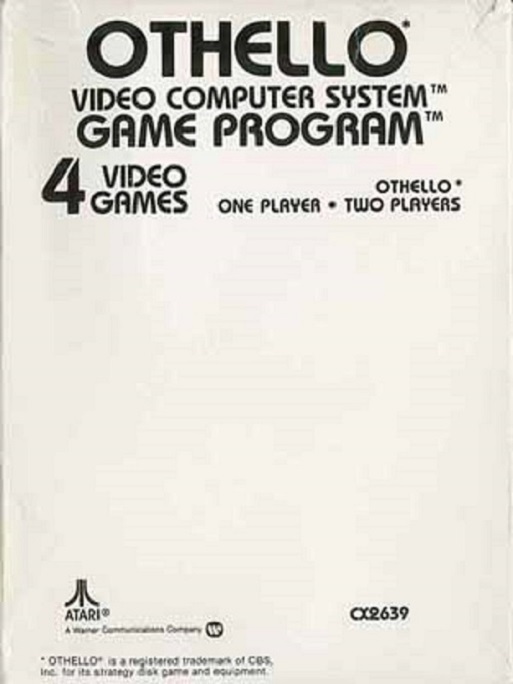 All cartridges have the “game” program written, so that is where you would look for 2nd or 3rd text versions. The photo below shows the end labels of the same three cartridges from above. The one on the left is the 1st text version. Notice the number 21 before the game. All the original gate-fold games had numbers before their names. The 2nd text version again shows the straight “e” and the 3rd text shows the slanted “e”. The next photos we'll begin the picture labels. The first one on the left, known as PicBl is your normal black label with a picture. You will find this on many games, especially those released before 1982 or so. The middle picture was the next step. Get rid of the black and go to a silver label. This is known as PicSil1. 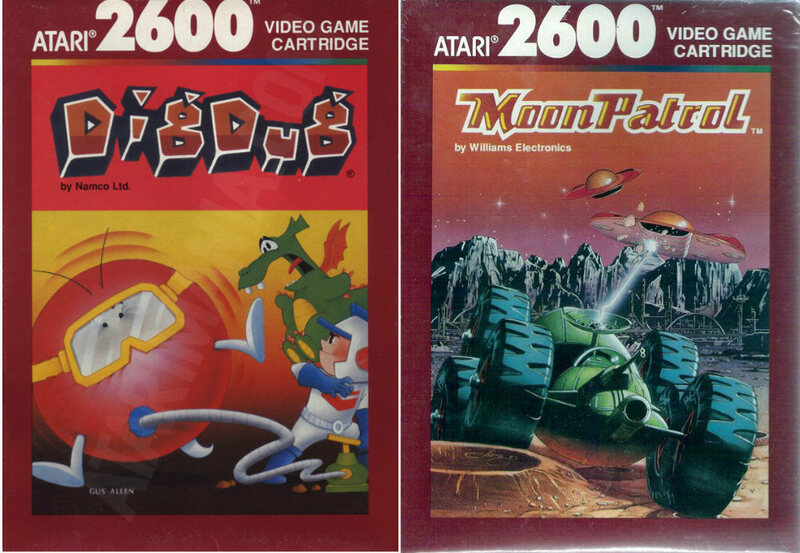 The first silver version has a smaller picture with the Atari 2600 at the top in the middle. The cartridge on the right is known as PicSil2, the second silver version. The picture has gotten larger and the Atari 2600 is smaller and moved to the upper right corner. 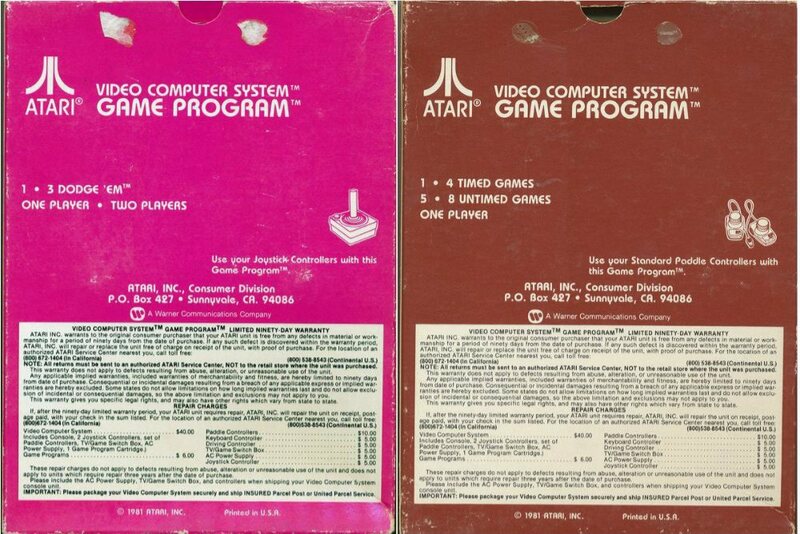 Above we see the Atari grey labels. They are the exact version of the silver variations but have a dull grey color. The one on the left featuring Ms. Pac-Man is categorized as PicGr1 meaning grey 1. It has the small photo with the large Atari logo centered above it. The one in the middle, Battlezone, is PicGr2 being the grey 2 version. It has the larger photo with the small Atari logo moved to the upper right. On the right we see something strange. This Ms. Pac-Man but does not have an Atari logo. I have scans for 2 variations of this type of label. I don't know where it's from, or that it's possibly a pirate. I'm showing it here for info purposes and maybe a reputable collector can confirm this is legitimate. I called this PicGr0 meaning grey 0 because it has nothing. Though I have this in the variation listing, I'm hesitant on calling it real. 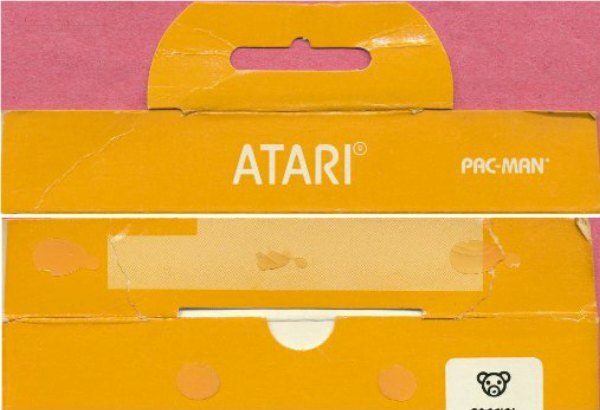 If you look at the label, it's longer than the indentation and is square whereas normal Atari labels have rounded corners. In most cases, cartridges that have the 1st grey also have a 1st silver version. Those that have the 2nd grey usually have the 2nd silver version. Above are the two red label versions. The only difference between the two is that Picred1, the 1st one Jr. Pac-Man, has a black and white photo. Picred2, the 2nd red one, Battlezone, has a color photo. Above we have the two brown versions. PicBr1, brown 1 on the left, Mouse Trap, is similar to silver 1 version. It has the large Atari logo in the center above the smaller photo. On the right, PicBr2, brown 2 on the right, is Battlezone. Again, the photo got larger and the Atari logo is small and moved to the upper right corner. This is similar to silver 2 version. There are not too many brown versions. They are much darker than their red counterparts, thus I gave it its own category. Above are the 4 different licensed labels. These were aimed at kids. Each one has a checkered background. The first is the Sesame Street games with the yellow label. There were four released in all. The purple label was designated for the Muppets. The only released game was the Pigs in Space shown. The red label is for the Peanuts license. 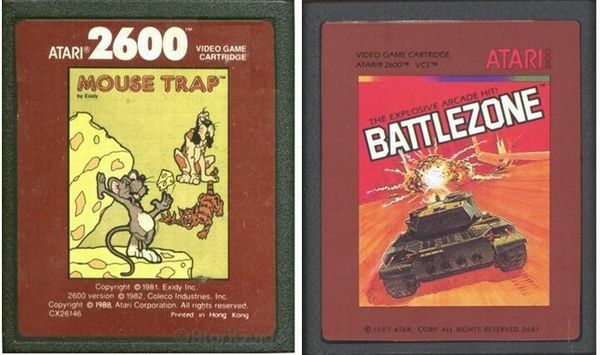 The only released game was Snoopy and the Red Baron shown. The last cartridge is the blue label which was Disney. The only released game was Sorcerer's Apprentice shown, but there was a Snow White release of the prototype in a collector's edition of 250 numbered pieces. 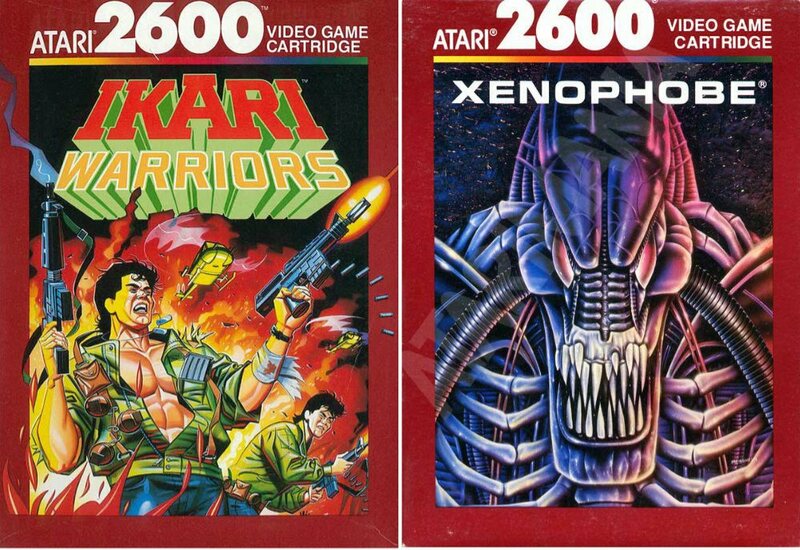 Atari made a few strange labels that are not categorized under any of the listings we've talked about so far. The one on the left is Track & Field. This is the only label version known. The closest it would come is to a grey 2. The middle cartridge is a late release of Breakout with an orange label. Another unique item, though Breakout has many variations. Star Ship is our 3rd photo on the right above. This has been dubbed an “odd” label, again like no other released. We move on to the PAL labels. These are in the PAL format, which cannot run on a normal tv. The screen will flip vertically, thus you know you have a PAL cartridge. In most cases, you know you have a PAL cartridge because it is on the cartridge label somewhere. Above we show the many examples of PAL cartridges. The first is the text label where the product number has a “- P” added to it. The arrow points at this in the first Superman example. The second Superman shows a “PAL” stamped on the label, also pointed out by the arrow. 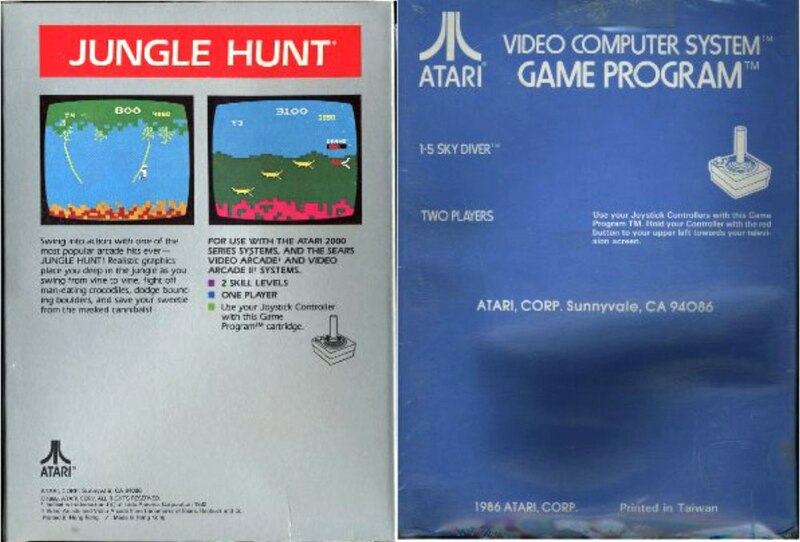 The third cartridge is Combat, where Atari actually printed PAL on the label as shown with the pointing arrow. On the second line, I began by showing only an end label, in this case it came off a silver version of Pole Position. The main label does not have any notification the cartridge is PAL, but rather the “p” on the end label denotes it. Problems arise if these end labels fall off. The “p” on the end label is found in the black, silver and sometimes grey picture labels. Next to the Pole Position end label, we actually have a grey version of Pole Position where the “p” comes after the product number on the main label. This is a rarity. On the red and brown labels, the “p” is printed after the product number. This is the standard for PAL cartridges with these labels. Below are the boxes in what we consider their timeline release order. This describes the same game title with different box printings. If anyone has other information that can help, please contact us. We are guessing the order based on the revision numbers that were printed on the tiny flaps, or sometimes lack of revision numbers. You can find the revision numbers either at the top or bottom of the tiny flaps, in the form of Rev 1, Rev 2, etc. We are also using the date that is printed on the tiny flaps by the printer as a second and more important guideline. Sometimes the same identical box with Rev number is printed by more than one printer over a span of several years. Under each individual listing for boxes, we have added or will be adding the printer with their printing date and will eventually be revising the order of the boxes shown in what we perceive to be the correct chronological order of release. I'm listing them here and will give better explanations under each photo section. The most popular known printers are Bertco Graphics, Adpak San Francisco, Ivy Hill, Shorewood Packaging, and SUS. There are some other items sometimes written on the tiny flaps that may identify or belong to a company, but we've yet to identify them. 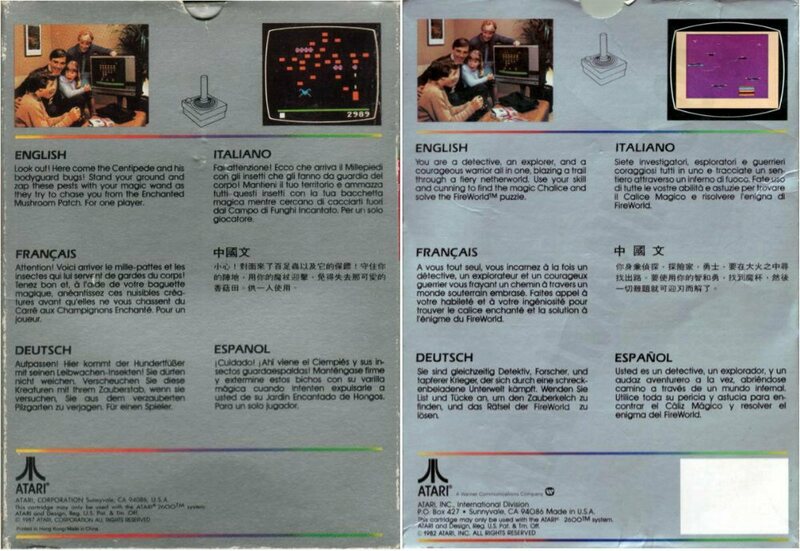 - Various boxes with foreign/multi-languages on the back and Unique type boxes in a league of their own are shown near the end and may have been released at any time. The printing date should be easily identified by the copyright date on the box or the printer date on the tiny flap. 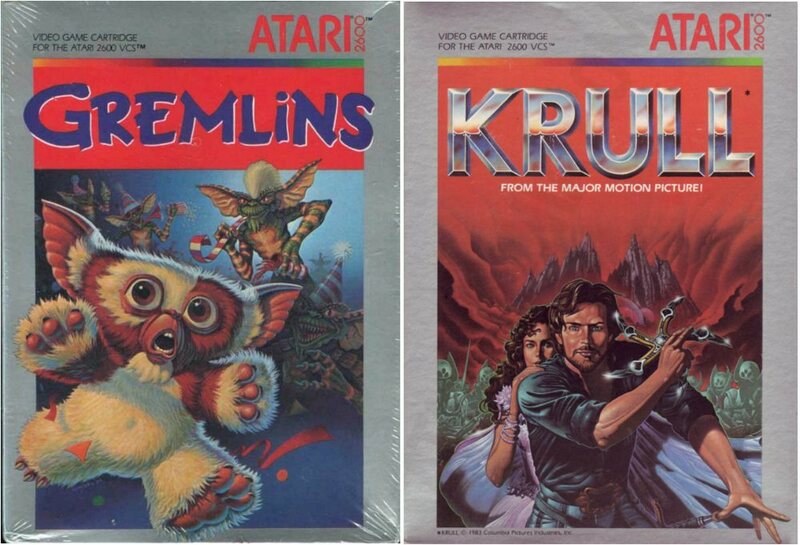 Above we have the first released Atari games, which were in a gatefold book-style type of box. There were 9 released games with this style. Each of these had two digits after the title on the side of the box, representing the cartridge product number. No gatefold boxes have printers or print dates, though since the system and games were released in September, 1977, we can assume the boxes were printed at least 2 months earlier. The nine games are Air-Sea Battle, Basic Math, Black Jack, Combat, Indy 500, Star Ship, Street Racer, Surround, and Video Olympics. 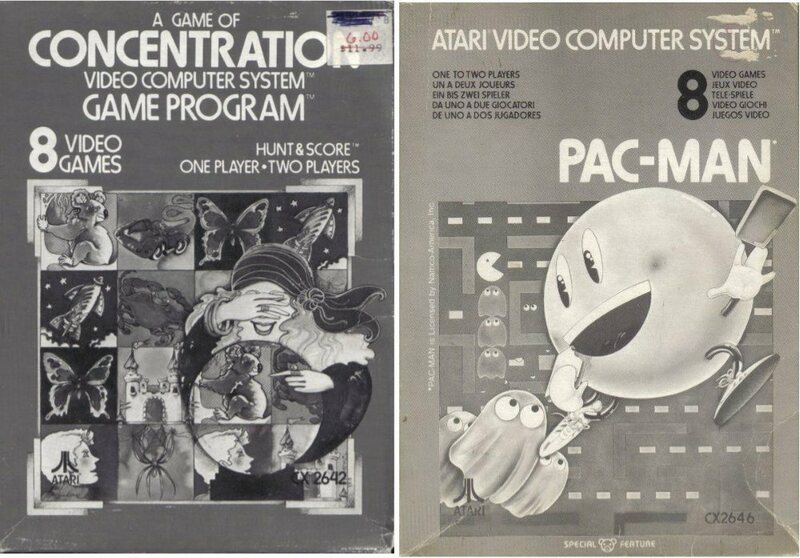 The second release boxes were the ones with the giant “Game Program” on the back of the box. None of these boxes have any Rev on the tiny flaps, so they were probably the first standard flap closing box. Any box with the “Game Program” is dated 1978. Printers include no printer, Adpak San Francisco, Bertco Graphics, and Fidelity Packaging Corporation (Flag Capture, Home Run, and Slot Racers). There were either no printer dates or dates ranging from June to August, 1978. Confirmed games with this box are Air-Sea Battle, Basic Math, Basketball, Black Jack, Brain Games, Breakout, Codebreaker, Combat, Flag Capture, Hangman, Home Run, Hunt & Score, Indy 500, Outlaw, Slot Racers, Space War, Star Ship, Street Racer, Surround, and Video Olympics. We believe the third release boxes were ones that had a warranty box on the back, and the background of the warranty box was the same color as the box. The copyright date is outside below the warranty box and there is a repair charge for the system for $36 inside the box. We discovered about half of these have Rev 1, and the other half have Rev 4. Slot Machine has only one known box release and it has a Rev 4 on the flap. These games all have dates from 1978-1980. Printers include no printer (Combat), Adpak San Francisco and Bertco Graphics. Printer dates include no date (Bowling, Casino, Combat, Football, Space Invaders, and Video Chess) and range from November, 1978 to January, 1982. Rev 1 confirmed games are 3-D Tic-Tac-Toe, Adventure, Backgammon, Basic Programming, Championship Soccer, Circus Atari, Dodge 'Em, Golf, Maze Craze, Night Driver, Othello, Space Invaders (Rev 1 and 2 versions exist), Superman, Video Chess, and Video Pinball. Rev 4 confirmed games are Air-Sea Battle, Basketball, Bowling, Breakout, Canyon Bomber, Casino, Combat, Football, Home Run, Human Cannonball, Indy 500, Miniature Golf, Sky Diver, Slot Machine, and Street Racer. Unconfirmed Rev are A Game of Concentration, Fun with Numbers, Hangman, Outlaw, Video Checkers, and Video Olympics. The next regular boxes that were most likely released were all dated 1981. All of these have Rev 1 on the flaps. They have white warranty boxes with the copyright date outside the warranty box and the system repair charge has increased to $40. Even though they are Rev 1, we think this is a later release due to the 1981 date. Printers include Bertco Graphics and Ivy Hill. All printer dates have fallen between March to May, 1981. The majority of these titles were originally released in 1977-1978. Confirmed games are Adventure (Rev ? ), Air-Sea Battle, Asteroids, Basketball, Bowling, Breakout, Circus Atari, Dodge 'Em, Football, Golf, Missile Command, Night Driver, Outlaw (Rev? ), Pele's Soccer (Rev ? ), Slot Racers (Rev ? ), Space Invaders (Rev ? ), Superman, and Warlords. The next release we think is the white background warranty box on the back with the copyright date inside the warranty box. The system repair charge has been removed from inside the warranty box. These all have Rev 2 on the flaps. They are also dated between 1978-1980. Printers include no printer (Othello), Adpak San Francisco, Bertco Graphics, and Ivy Hill. Printer dates range from May to October, 1981. 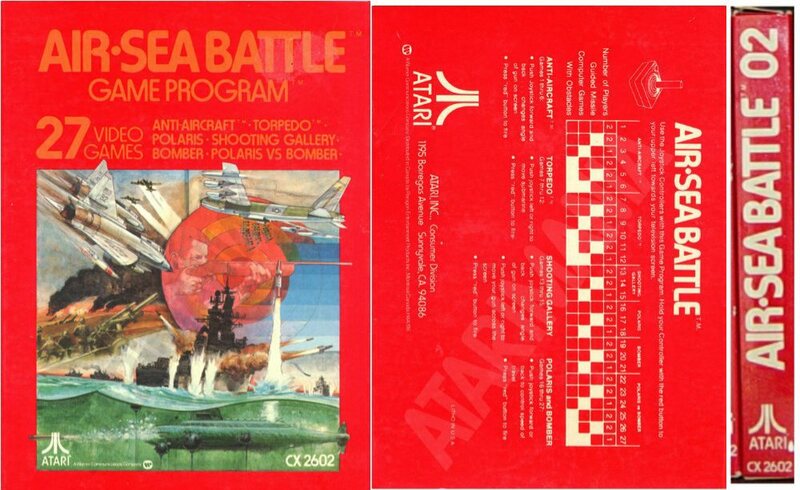 Confirmed games are Adventure, Air-Sea Battle, Asteroids (1981), Backgammon, Basic Programming, Bowling, Circus Atari, Combat (Rev 1), Dodge 'Em, Golf, Home Run, Indy 500, Missile Command, Night Driver, Othello, Outlaw, Pele's Soccer, Slot Racers, Space Invaders, Street Racer, Super Breakout (Rev 1), Superman, Video Checkers, Video Olympics, Video Pinball, and Warlords. Unconfirmed Rev are Brain Games, Breakout, Canyon Bomber, Codebreaker, and Maze Craze. The last regular box release is the “limited ninety day warranty” on the back with no real warranty box. I believe that Atari didn't want to print the huge warranty any longer, which cost more in ink. Printers include no printer (Combat Macau), Adpak San Francisco, Bertco Graphics, Ivy Hill, Shorewood Packaging, and hop. Printer dates on these boxes range from October, 1981 through June, 1984. All of these boxes have Rev 3 on the flaps. There are four exceptions: Combat Rev 2 (Macau), Space War Rev 1, Super Breakout Rev 2, and Surround Rev 1. These four boxes did not have any of the three previously described boxes except for Combat, and thus may have been the next revision from their perspective original boxes. Confirmed Rev 3 games are Adventure, Backgammon, Basketball, Brain Games, Breakout, Casino, Circus Atari, Football, Hangman, Home Run, Human Cannonball, Indy 500, Maze Craze, Missile Command, Night Driver, Othello, Street Racer, Superman, Video Checkers, Video Chess, Video Olympics, Video Pinball, and Warlords. Unconfirmed Rev are Bowling, Dodge 'Em, Sky Diver, Slot Racers, and Space Invaders. 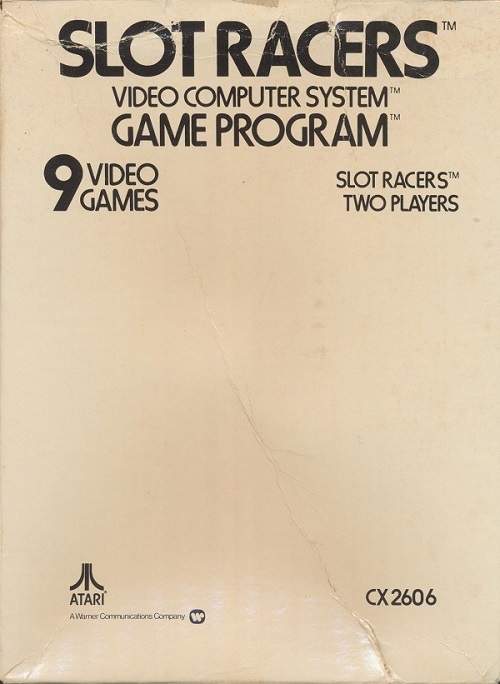 Before the silver labels were released, in 1981-1982, 8 games were released that did not fit into any of the categories above. These came in colored boxes. Printers include Adpak San Francisco, Bertco Graphics, Shorewood Packaging, and Ivy Hill. Printer dates range from January to August, 1982 and include August, 1983 for Pac-Man. The titles are Berzerk, Defender, Demons to Diamonds, Haunted House, Math Gran Prix, Pac-Man, Star Raiders, and Yars' Revenge. 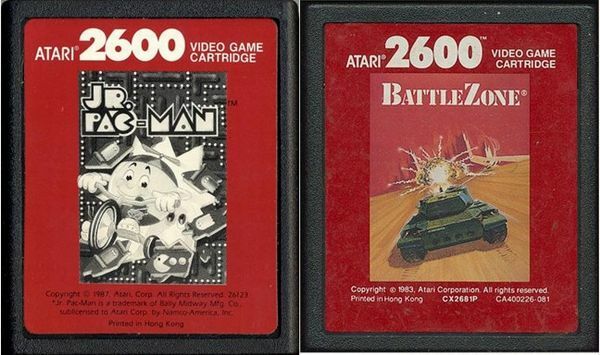 In 1982, Atari decided to change the format for their new games with silver labels on the cartridges. They created silver boxes. 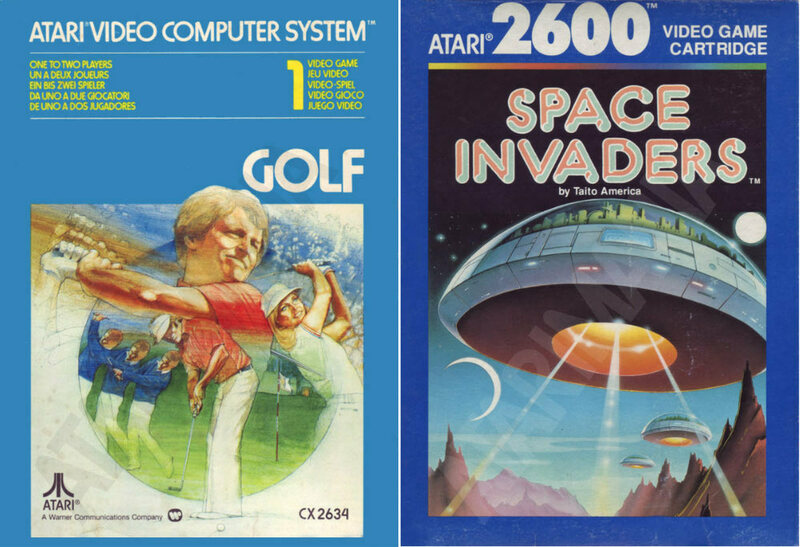 The 1982 silver box had Atari 2600 in the center above the picture of the game. Several titles were released and all have this format. This format carried over into 1983 for several games. Printers include Bertco Graphics, Ivy Hill, Shorewood Packaging, and AGI. Printer dates range from September, 1982 to May, 1983. 1982 confirmed games are Centipede, E.T., Ms. Pac-Man, Phoenix, Raiders of the Lost Ark, Realsports Baseball, Realsports Football, Realsports Volleyball, Swordquest Earthworld, Swordquest Fireworld, and Vanguard. 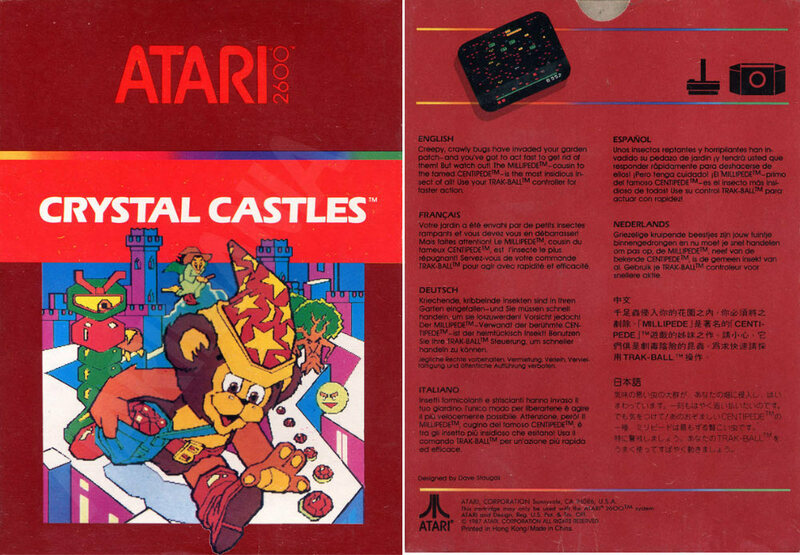 1983 confirmed games are Asterix, Atari Video Cube, Crazy Climber, Obelix, Realsports Soccer, and Realsports Tennis. The only 1984 game with this format is Rubik's Cube. In 1983, Atari decided to change the silver box similar to the way they changed the silver label. 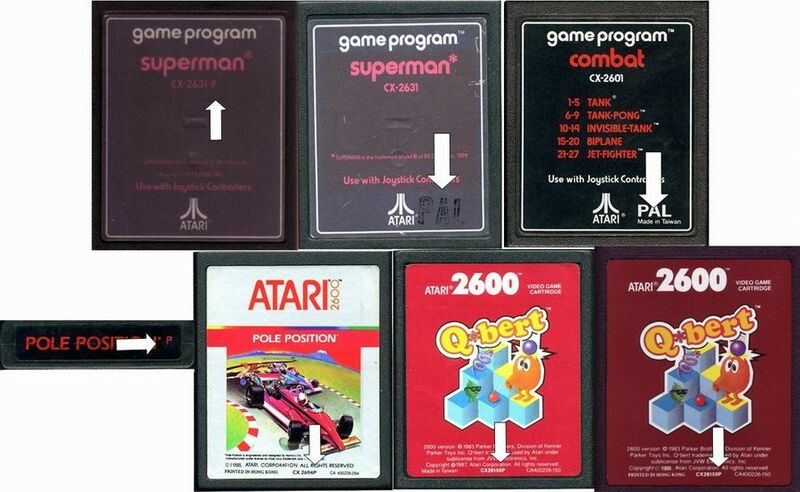 They moved the Atari 2600 name from the middle above the picture to the upper right part of the box. Printers include Ivy Hill, Shorewood Packaging and AGI. Printer dates range from May to September, 1983. 1983 confirmed games are Battlezone, Dig Dug, Gravitar, Joust, Jungle Hunt, Kangaroo, Krull, Mario Bros., Moon Patrol, Pole Position, Quadrun, Swordquest Waterworld, and Taz. 1984 games with this format are Crystal Castles, Gremlins, Millipede, Pengo, and Stargate. Before Atari went to the red boxes, there were several titles that had unique style boxes. Track and Field came out in 1984 and is similar to the later silver box, but the back was not silver. The other games were geared towards young children. These were in checkered boxes, similar to the cartridge labels mentioned above. Printers include Ivy Hill. Printer dates include August, 1983. 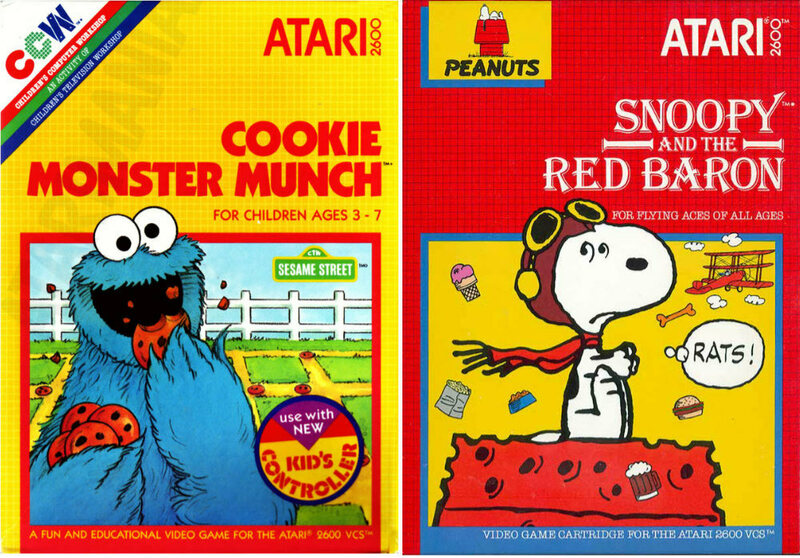 The games were Alpha Beam with Ernie, Big Bird's Egg Catch, Cookie Monster Munch, Oscar's Trash Race, Pigs in Space, Snoopy and the Red Baron, and Sorcerer's Apprentice. 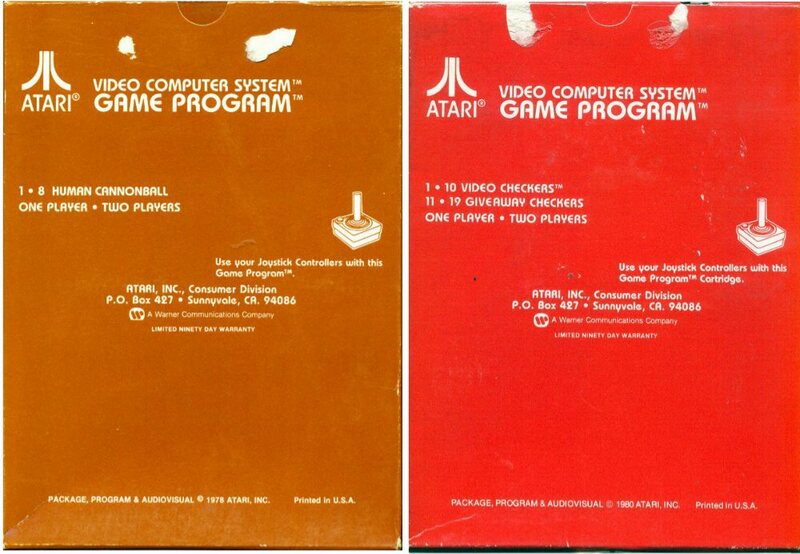 The red boxes were the final release for Atari, occurring between 1986-1990. Some titles were acquired from 3rd party companies like Coleco and Parker Brothers. Most were original titles. Printers include Faith Luck, GC, Kuang IH, MW, NC, VC, WA-TA. Printer dates range from August, 1987 to June, 1990. The following games were released with red boxes. 32-in-1, BMX Airmaster, Crossbow, Dark Chambers, Desert Falcon, Donkey Kong, Donkey Kong, Jr., Double Dunk, Fatal Run, Ikari Warriors, Klax, Midnight Magic, Motorodeo, Mouse Trap, Off the Wall, Q*Bert, Radar Lock, Road Runner, Secret Quest, Sentinel, Solaris, Sprintmaster, Super Baseball, Super Football, Venture, and Xenophobe. 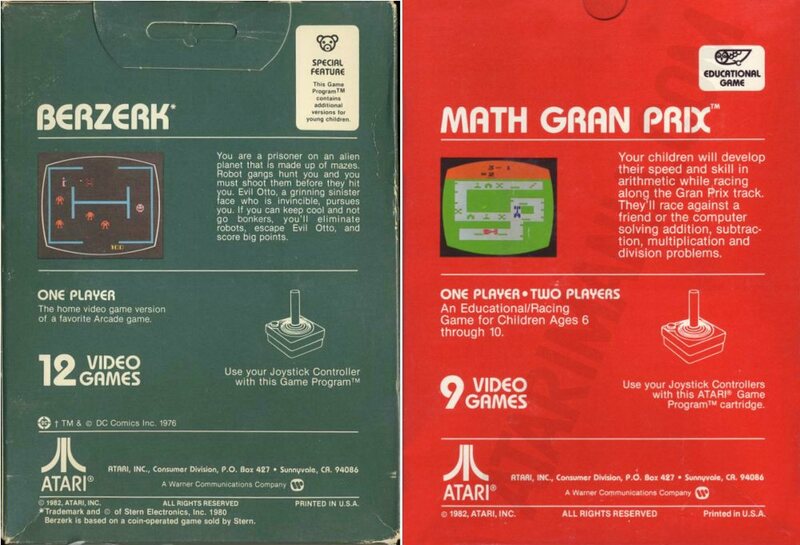 In the early 1980s, Atari re-released some games in small packs. 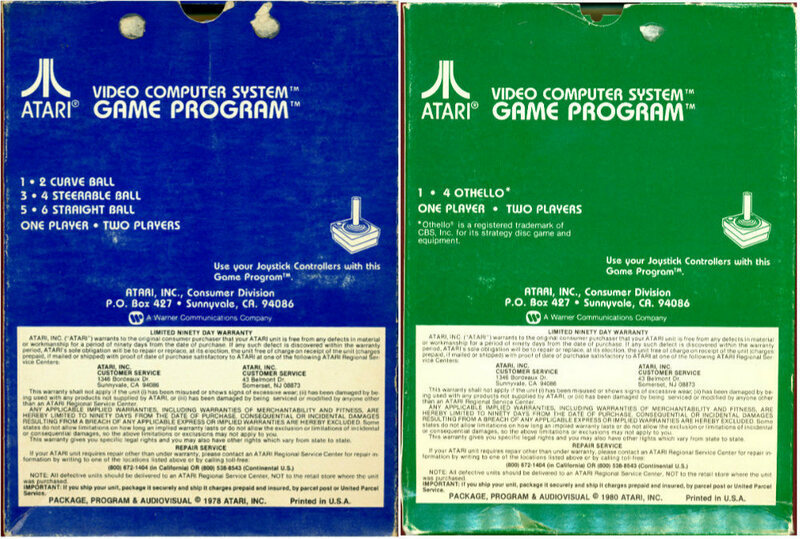 The games inside these packs were put in generic no-frills boxes as shown above. The packs themselves, spelled Pak, are rather hard to come by. So far I can only confirm one printer, Adpak San Francisco, and one date of January, 1982. The Paks themselves are as follows and the games included with those Paks are given afterwards. There were a total of 7 games in the no-frills boxes. Action Pak contained Breakout, Dodge 'Em, and Othello. Back to School Pak contained Basic Programming and Brain Games. Racing Pak included Indy 500 and Slot Racers. 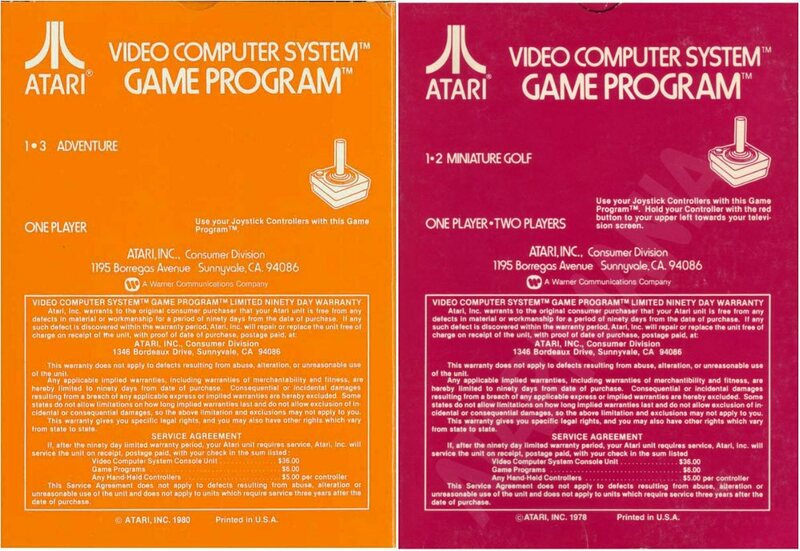 Atari later re-released games with different colored boxes from what were originally produced. The grey-tone box versions of these games are extremely popular. Printers include Kuang IH and MW. Printer dates range from August, 1986 to June, 1988. Confirmed grey-tone box games are A Game of Concentration, Basic Programming, Basketball, Black Jack, Bowling, Brain Games, Canyon Bomber, Codebreaker, Demons to Diamonds, Flag Capture, Fun with Numbers, Golf, Hangman (has color picture), Home Run, Maze Craze, Night Driver, Outlaw, Pac-Man, Realsports Volleyball, Surround, and Swordquest Earthworld. 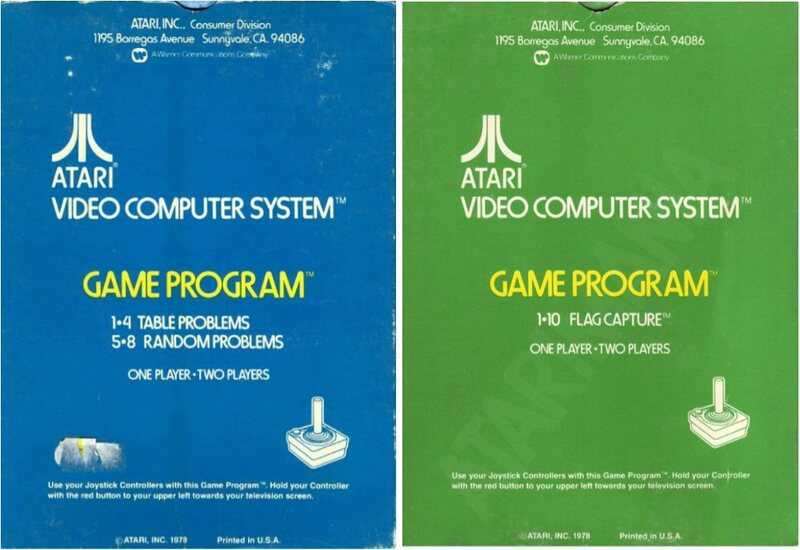 Besides the grey-tone boxes, there were many titles released under the Atari, Corporation or Atari, Corp. license that remained in their original color boxes. 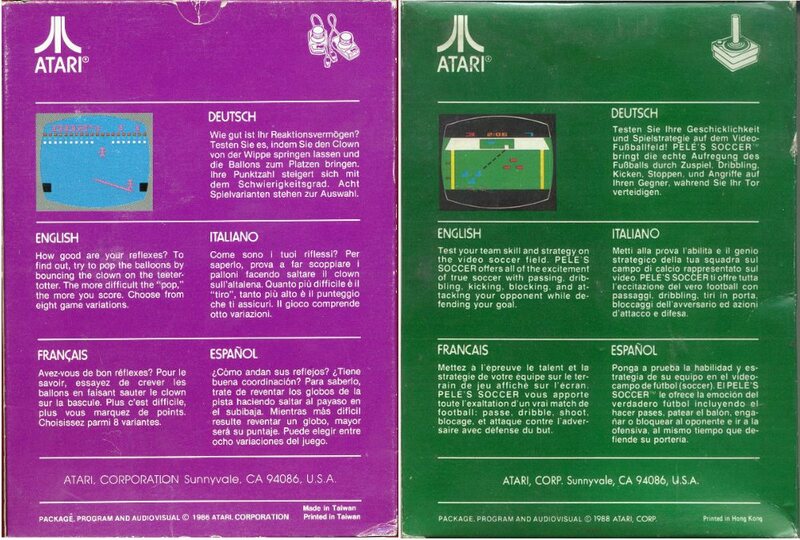 These boxes were English release only, no multi-languages. Most were released between 1985-1988. Printers include Faith Luck, Kuang IH, Valour, and WA-TA. Printer dates range from March, 1986 to August, 1988. No particular dates will be listed, but the following titles have been confirmed: 3-D Tic-Tac-Toe, Air-Sea Battle, Asteroids, Backgammon, Battlezone, Combat, Crystal Castles, Dig Dug, Dodge 'Em, Indy 500, Jungle Hunt, Krull, Math Gran Prix, Millipede, Othello, Pac-Man, Pole Position, Realsports Baseball, Realsports Football, Realsports Tennis, Sky Diver, Sorcerer's Apprentice, Stargate, Star Raiders, Taz, and Video Checkers. 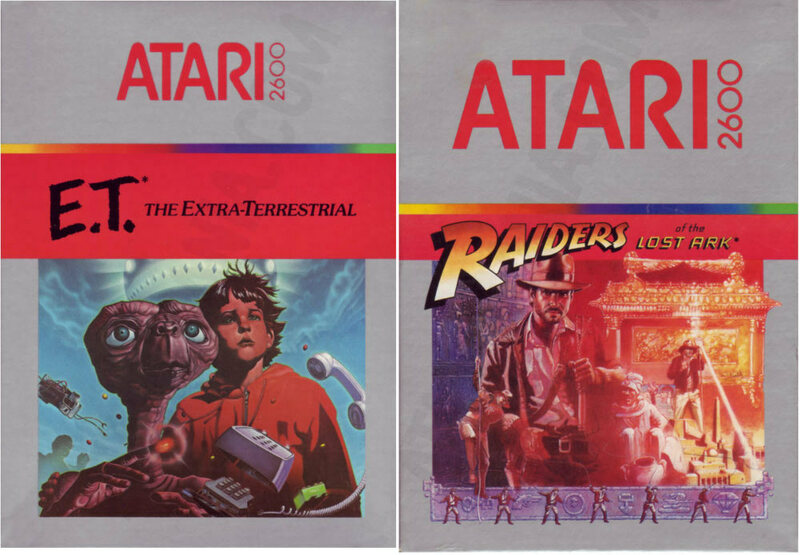 Atari also re-released many games in the red box like was discussed above. Confirmed games are Asteroids, Battlezone, Basketball, Defender, Dig Dug, Dodge 'Em, Galaxian, Gravitar, Joust, Jungle Hunt, Kangaroo, Mario Bros., Millipede, Missile Command, Moon Patrol, Ms. Pac-Man, Phoenix, Pole Position, Realsports Soccer, Realsports Tennis, Realsports Volleyball, Space Invaders, Vanguard, and Yars' Revenge. Besides the red box versions, there was a brown box version. I called this brown box because the box looks more like a brown red and the back of the box has the same color as the front. Red boxes have a white back. There are four confirmed games with the brown box: Battlezone, Crystal Castles, Galaxian, and Millipede. 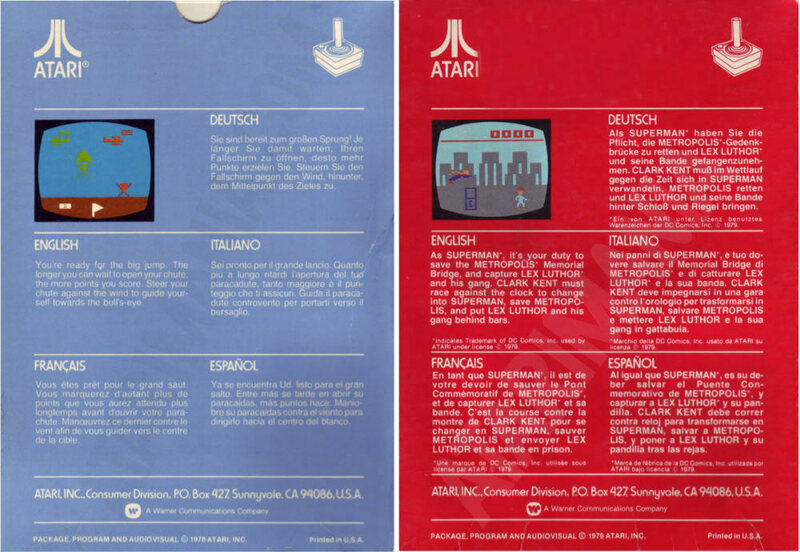 Many titles were released with multi-language formats on the box. We're breaking the lists down to some specifics. This first area are games released with 5 languages on the box with the original year of release of the game. Printers include Shorewood Packaging. Printer dates include July, 1982. The confirmed games are 3-D Tic-Tac-Toe, Adventure, Asteroids (1979), Backgammon, Basic Programming, Bowling, Brain Games, Casino, Circus Atari, Combat, Defender, Demons to Diamonds, Desert Falcon, Dodge 'Em, Haunted House, Human Cannonball, Indy 500, Math Gran Prix, Missile Command, Maze Craze, Night Driver, Othello, Outlaw, Pac-Man, Pele's Soccer, Q*Bert, Sky Diver, Space Invaders, Star Raiders, Street Racer, Super Breakout, Superman, Video Checkers, Video Chess, Video Olympics, and Yars' Revenge. 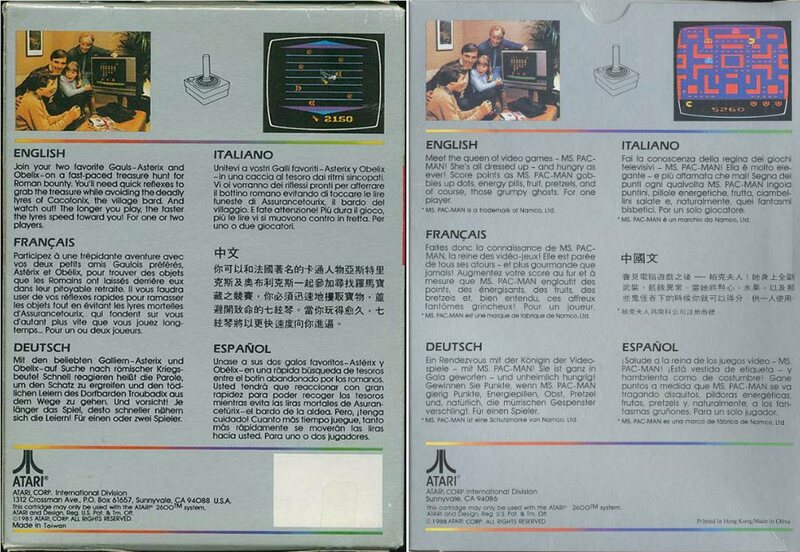 The next list has games that have 6 languages on the back again with the original year of release of the game. The confirmed games are Alpha Beam with Ernie, Battlezone, Big Bird's Egg Catch, Centipede, Cookie Monster Munch, E.T., Galaxian, Joust, Jungle Hunt, Kangaroo, Moon Patrol, Obelix, Pigs in Space, Pole Position, Raiders of the Lost Ark, Realsports Soccer, Realsports Volleyball, Snoopy and the Red Baron, Swordquest Fireworld, and Vanguard. There were a few titles that had the box variation with 5 languages that were released some years after the original year of release. Confirmed games are Circus Atari, Defender, Missile Command, Pac-Man, Pele's Soccer, Space Invaders, Super Breakout, and Swordquest Earthworld. There were also several titles that had the box variation with 6 languages that were released some years after the original year of release. Confirmed games are Asterix, Battlezone, Centipede, Dig Dug, Galaxian, Kangaroo, Mario Bros., Moon Patrol, Ms. Pac-Man, Phoenix, Realsports Soccer, Realsports Tennis, Realsports Volleyball, Snoopy and the Red Baron, and Vanguard. Finally we're going to cover box variations that didn't fit into any of the above categories. We're picturing a couple above the paragraph and a couple below. These are rather unique to themselves and I personally find them extremely interesting for collecting. Confirmed strange variations are Berzerk with red box and 3 languages dated 1987; Crystal Castles with 8 languages dated 1987; Defender with 2 languages dated 1986; Golf with light blue box and 5 languages dated 1980; Millipede with 8 languages dated 1984 and 1987; Miniature Golf with red box and 5 languages dated ? ; Obelix with 5 languages on front of box only, back in English dated 1986; Realsports Football 1982 with 3 languages on back, Slot Racers with blue box and 5 languages dated 1978; Space Invaders with silver box and 6 languages dated 1980; Space Invaders with blue box similar to red box format and 5 languages dated 1988; Space War with pink box and 5 languages dated 1978; Star Ship in a strange format box dated 1977 (probably the 1977 label came in this); Surround with purple box and 5 languages dated 1978; Video Pinball with purple box and 5 languages dated 1980; Video Pinball with purple box and 3 languages dated 1985; Warlords with orange box in English dated 1981; Warlords with orange box and 5 languages dated 1981; Yars' Revenge with 2 languages dated 1985 and 1987. There are actually many more variations out there. Most are just year changes or where the box was Made or Printed. Look at each individual title for all known variations. If anyone has contributions or corrections, please contact me. Scans would be appreciated. There are many variation listings that would fit into the criteria above already on the list, but I have not been able to confirm Rev numbers or possibly the copyright year of the box. I'm sure there are even more box variations not on the list and I would appreciate any new listings. Thanks in advance. Here we have the types of flaps that we describe the boxes having. The original games had the book opening type box, but afterwards, the boxes were opened at the top flap. The first released type of flap was what we call the standard flap style. The top flap lifts up, and there is a small finger hole on the back of the box for easier opening. The second we call the glued flap style. This has a tab that is attached to the top flap, and was initially glued to the top of the back of the box. If opened correctly, this small tab remained intact and can be inserted in a hole located in the secondary top flap. The third type of flap we call the tab flap style, which is part of the top flap. The tab is not an additional piece like the glued flap, but is die-cut into the top flap and there is a slit in the secondary flap to tuck it in. This is similar to many cereal boxes.